HOW WELL DO hospitalist groups do when it comes to bringing new physicians on board? Our cover story answers that question by looking at the onboarding practices of several programs. What’s all the fuss about onboarding? If you do a good job bringing on new hires, the thinking goes, they’ll be more satisfied in their work. And the happier physicians are, the less likely they are to leave. From what we’re hearing, some hospitalist groups may not have as much trouble recruiting as they did 10 years ago. But when it comes to retention, many programs still find themselves with a revolving door. Data from the latest Today’s Hospitalist survey show that while group members expect to add on average two to three physicians this year, most lost about that same number the previous year. That means that many groups are basically treading water when it comes to recruiting and retaining physicians. How can hospitalist programs do better? 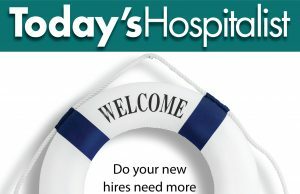 Some groups are giving new hires time to acclimate to the practice with reduced patient loads that extend out as long as four to six weeks. Just as importantly, groups are also realizing that becoming comfortable with a local practice and its culture can take months or even a year—and that new hires need to feel that practices are investing in their growth and satisfaction. If you’re thinking that your group can’t afford to give a new physician that much time to settle in, our coverage outlines strategies that are more budget-friendly. It shouldn’t cost your group anything, for instance, to have mentors check in with new hires occasionally and make sure everything is going OK.
And if you think that all this onboarding talk is much ado about nothing, just consider the alternative.